Dogs must be friendly around people & other dogs. Here’s a chance for your son or daughter and your dog to both go to camp! Our five day, three-hour summer sessions will help them form a special relationship as partners and friends. They will play games, practice tricks, and even do Agility! Your child will learn your dog’s language, and will come home each day excited to show you what your dog can do. 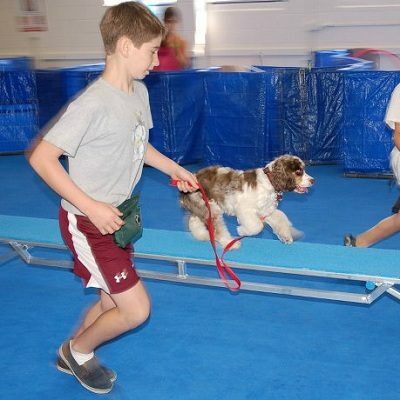 Our facility has a padded floor, dividers, and hooks on the walls, so your child and dog can work safely together.